Hi Gail, thanks for your feedback. Kindly note that voice recognition is a standard Android API offered by Google which works pretty good. I’d recommend making sure that English language is selected in voice recognition section, or you may want to try selecting English (U.S.) if it is available in Home –> Menu –> Settings –> Voice Input & output –> Voice recognizer settings –> Language. I have just download the Lite version to try it before I buy the full featured version. I have customized my aisles and have added my grocery items into “My Pick List” through the manual entry. If I am correct the only way that my “List” is populated is to select from the “Pick List”. However, I can not determine how to apply this list to a specific store since the “List” does not populate until a selection is made and the store cannot be selected from the “Pick List” grocery items. Maybe I am using the software incorrectly and should have populated the “List” but then I would not know how to create a shopping list that would be cleared after I check out. H-E-L-P.
Hi Roger, thank you for your interest in our app and your question. Kindly note that adding items from Pick list is not the only way to populate a shopping list. You may want to consider adding items from Favorites or History as well as using Add button (Plus) under List tab. If you would like to store your items per store, the List-specific favorites might be helpful. When I was trying out the lite version, it didn’t list the aisles in the list. I figured it would when I bought the full version and yet it doesn’t. The preview screens show aisles so I’m not sure what is wrong. Hi Scott, thanks for your question. This Frequently Asked Question may be helpful. Please let me know if you have any further questions. Just downloaded the Lite version yesterday and am still feeling it out. From what I can tell already this app is awesome. I have Never paid for an app before, but this may be the first. I like it that much. Great work! Jeff, thanks for your feedback! Feel free to contact us with any questions. 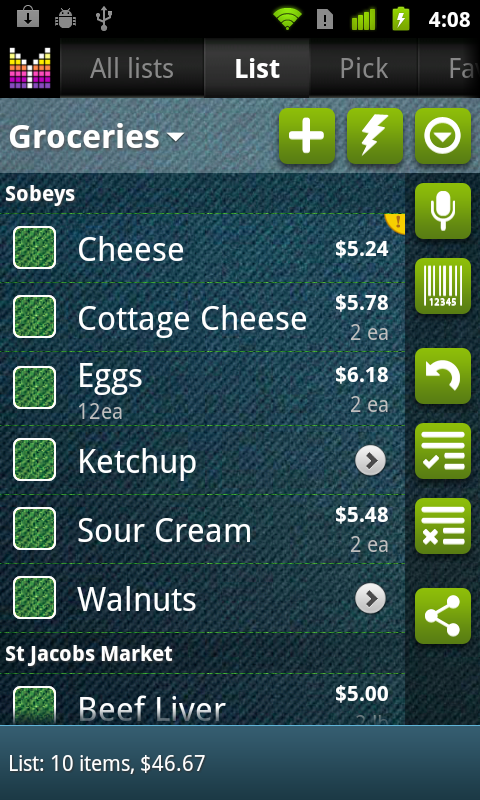 My wife and I both have Motorola Droid phones and had been using another app for grocery lists. 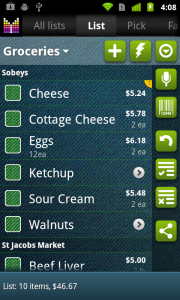 Lately we have been having lots of problems with it syncing so I purchased the Mighty Grocery app. I have tried to figure out from the instructions how we can sync the list between our phones and have not been able to figure it out. We usually shop together but go in different directions in the store so it is handy to have the list sync when one of us picks up an item. Does she have to purchase the app also for her phone in order for us to both have the list and be able to sync? Hi John, thank you for your interest in our app and your question. 1. On phone #1: go to Menu –> Settings –> Accounts. 2. Tap Add button (plus) if there is no account yet. 3. Open account for editing and make sure to fill in Email and Owner password fields. 4. Tap Cloud actions button –> Push lists –> Choose lists you’d like to share with your wife –> Push lists. 5. 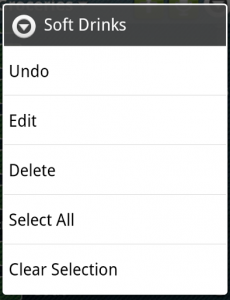 On phone #2: go to Menu –> Settings –> Accounts. 6. Make sure that Accounts list is empty. 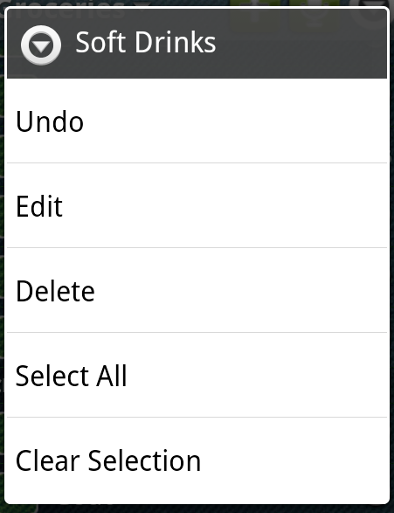 If it’s not, remove all records by long-tapping and choosing Delete from popup menu. 7. Tap Login button (Keys) and enter your Email and Owner password –> OK.
8. Under Edit account tab choose Account actions –> Pull lists –> Choose all lists –> Pull lists. 9. From now on your lists should be sync’d. For more details please see Sync with cloud User’s Guide. As for the app version, yes, both phones need to have Full version installed in order to get sync’d. Help. My tab bar will not scroll so that I can see the Aisles tab to edit them. Any sugestions. Hi Judith, thanks for your question. It is strange that the tab bar won’t scroll. Anyhow, you can access Aisles in Menu –> Settings –> Aisles. I truly love this app especially the voice command function that let’s u add new items to your shopping list or move them between categories ….. talk about awesome definitely the best on the market!!!!!! So far it does a lot of things. But I don’t think it will sync with my laptop. 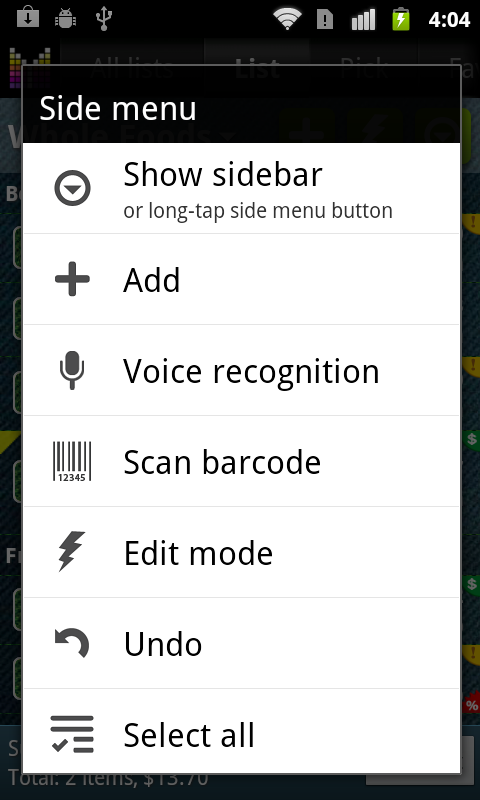 I hope I don’t have to type in items and update store rows on my phone. Let me know if there is a way I can have the list on my laptop and sync with my phone. I would like to enter information on my laptop and have it synced with my phone. I have had the SplashData program for years. I like that I can print the list if I need to. Hi, thanks for your feedback. Please see our Twitter for the invitation code to the Basic Web UI trial. Hoping it will work better then the one I have…. Thanks Renee. Looking forward to your comments.